Photo Courtesy of Jean Potter Although hummingbirds migrate back to the region in the spring, their hosts will need to provide a welcoming environment to keep these tiny birds buzzing around the yard all summer. Now that the hummingbirds have returned to the region, it’s important to know how to attract them and meet their needs. 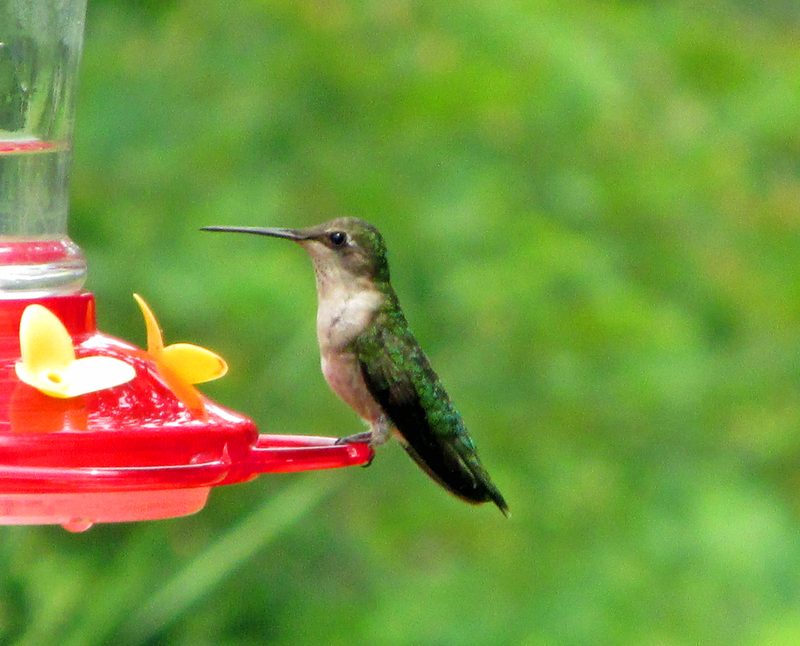 Like most living creatures, hummingbirds require three crucial things — shelter, water and food. A yard with evergreen trees or a thick hedge can provide perfect nighttime roosts for a hummingbird. 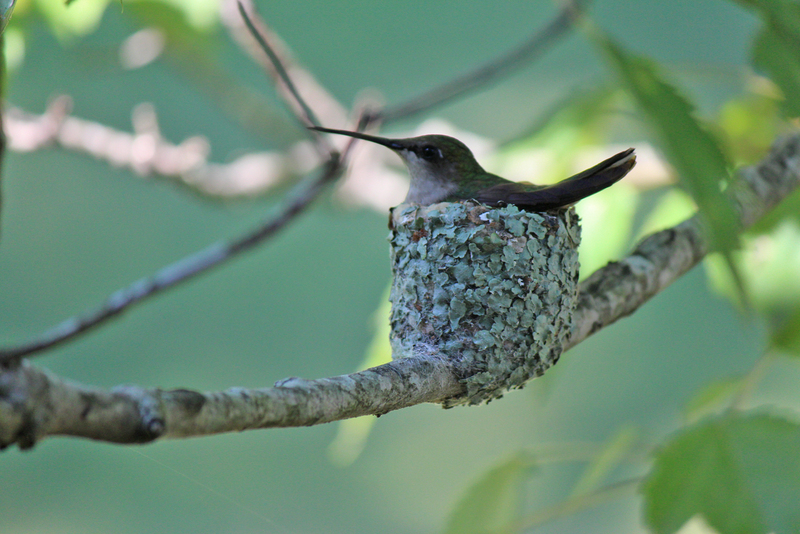 Other types of trees and shrubs also offer potential nesting locations for female hummingbirds. Hummingbirds, like all birds, need water. Hummingbirds can get a lot of their water in their diet, but they still need water for bathing. Birds bathe to keep their feathers in good condition. For hummingbirds, which are wizard aerialists among birds, it is even more crucial that their feathers are in good shape. A fountain, trickling waterfall or even a well-timed lawn sprinkler are almost magnetic in their attraction for hummingbirds, which are usually too small to bathe in a regular bird bath. Keeping visiting ruby-throated hummingbirds can be as simple as planting an abundance of the flowers they love, but offering multiple sugar water feeders also helps. Keep the sugar water mix at a four parts water to one part sugar ratio. Don’t offer honey in your feeders. When mixed with water, it can spoil and spread fungal diseases. There’s also no need to use a solution with any sort of red dye. Studies have indicated that such dyes could have adverse effects on hummer health. Remember that hummingbirds don’t subsist on sugar water alone. They also eat numerous tiny insects and spiders to obtain the protein they need for their dietary needs, so don’t use insecticides near feeders or flowers that hummers are likely to visit. 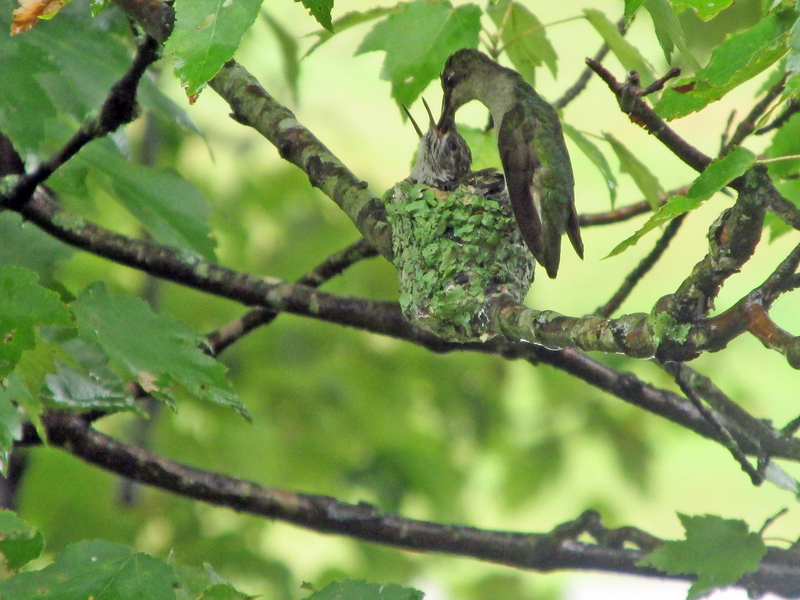 Photo by Bryan Stevens By now, female Ruby-throated Hummingbirds are getting ready to build nests and raise young. Follow these basic instructions and the hummingbirds will reward you with hours of enchanting entertainment this summer. » Harold Randolph spotted his first hummingbird in 2016 on Monday, April 11, near Marion, North Carolina, at Lake James. He sent me an email to report the happy fact. » Philip Laws in Unicoi County reported on Facebook that he saw his first spring hummingbird on April 11. » Betty Poole asked her daughter to email me to report that she saw her first hummingbird of spring on Wednesday, April 13. 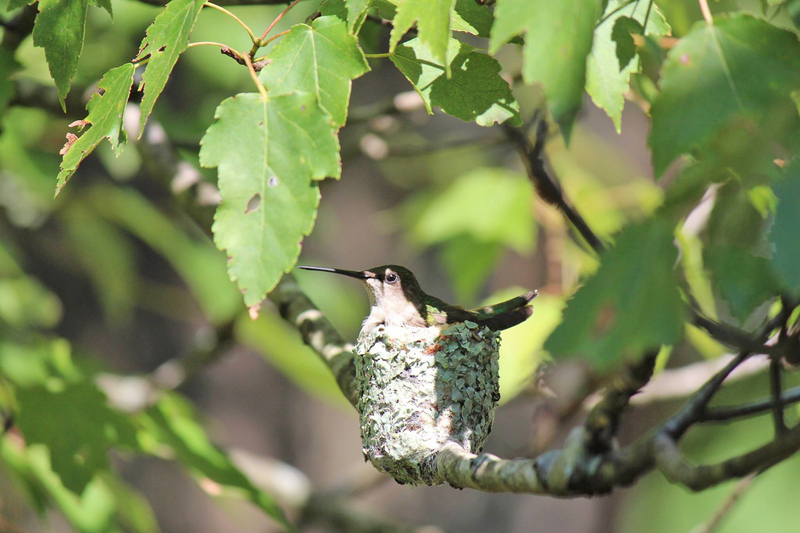 » Steve Meigs, who lives at an elevation of 2,800 feet in Limestone Cove’s Foxhound Hills community near Unicoi, reported that his first hummingbird arrived April 14 at 11:30 a.m. “That’s a few days earlier than the last few years,” he noted on his Facebook comment. He also reported other daily sightings, including brown-headed cowbirds, doves, finches, cardinals, red-winged blackbirds, sparrows, robins, starlings and downy woodpeckers. 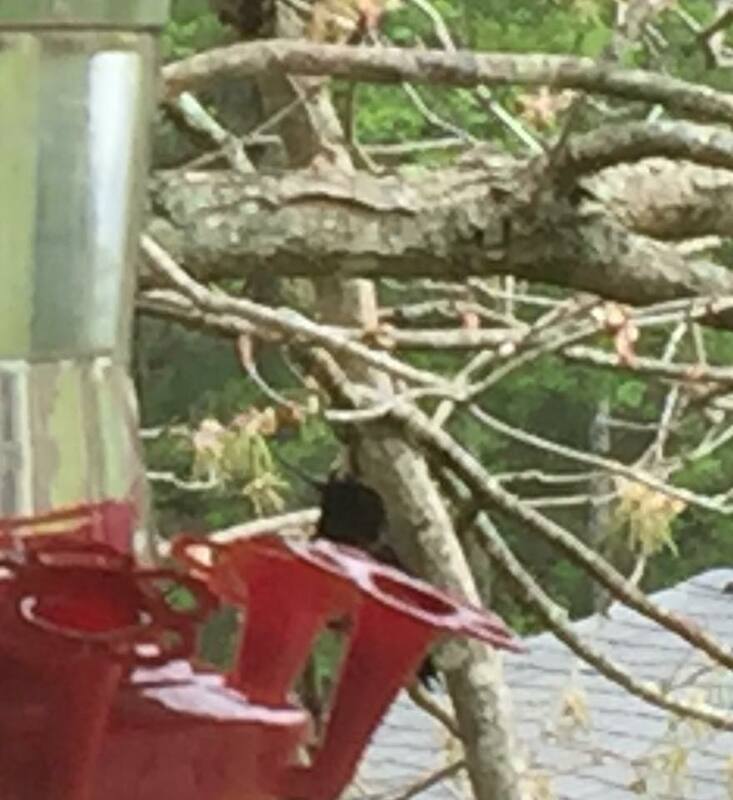 » Judy Brown, who lives in Damascus, Virginia, notified me that she saw her first hummingbird of the season on Monday, April 18. Photo by Bryan Stevens Flowers and sugar water feeders are just two ways to attract hummingbirds to your yard. 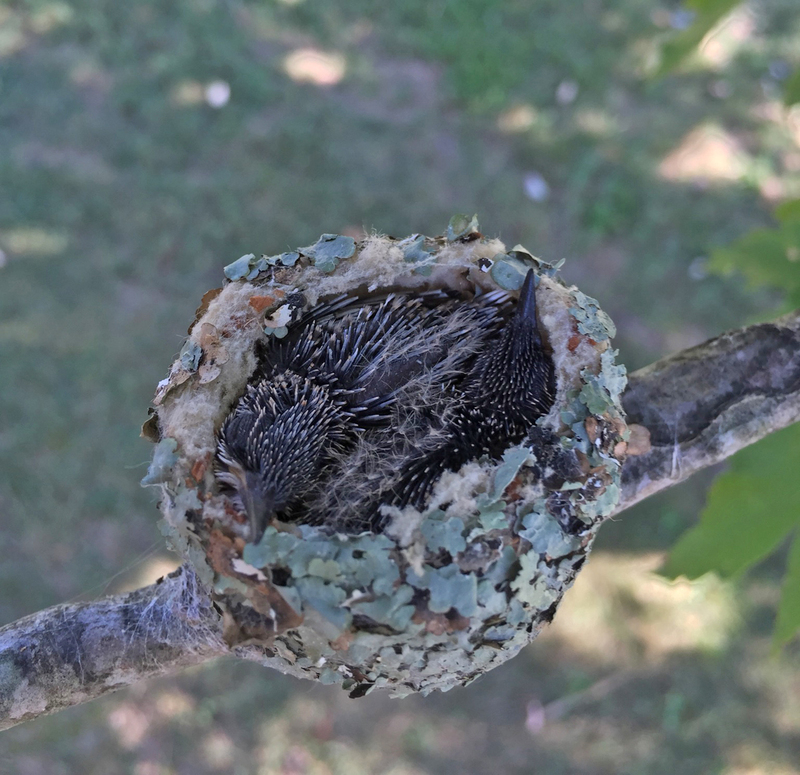 » Mary Beierle of the Stoney Creek community in Elizabethton, Tennessee, welcomed her first spring hummingbird at 6:13 p.m. on Monday, April 18. Mary was thrilled by their return. “Spring is finally officially here, in my opinion,” she noted. » Eddie and Delores Phipps of Bluff City, Tennessee, shared that their first sighting also took place on Monday, April 18. They had been out of town for the weekend, so they speculated that the hummingbirds might have showed up a day or two earlier. Constance Tate’s first sighting of a spring hummingbird involved not one, but two, birds. “There were two of them at the feeder at 3 p.m. on April 19,” she wrote in an email. Constance lives in Bristol, Tennessee, near Steele Creek. » Helen Whited informed me that hummers arrived at her home in Richlands, Virginia, on Tuesday, April 19. » Phyllis Moore of Bristol, Virginia, notified me by Facebook that she saw her first hummingbird of spring around 7:30 p.m. on Wednesday, April 20. 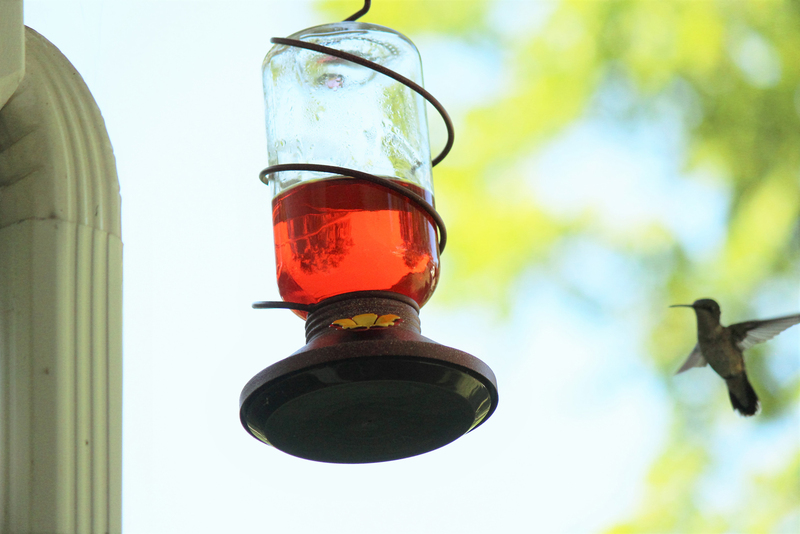 “My first hummingbird just buzzed past my window where I hang my feeder,” reported Patricia Werth in an email. “I guess I better get busy.” Patricia’s sighting occurred at 6:05 p.m. on Wednesday, April 20. » Nancy Vernon of Bristol was very excited when she spotted two hummingbirds at her feeder today at 5 p.m. on Wednesday, April 20, in Bristol. “They are very small,” she said, adding that the sighing involved a male and female pair. The insistent hummingbird — a male —was the first she had seen this year, although she has had her feeders out since the last week of March. 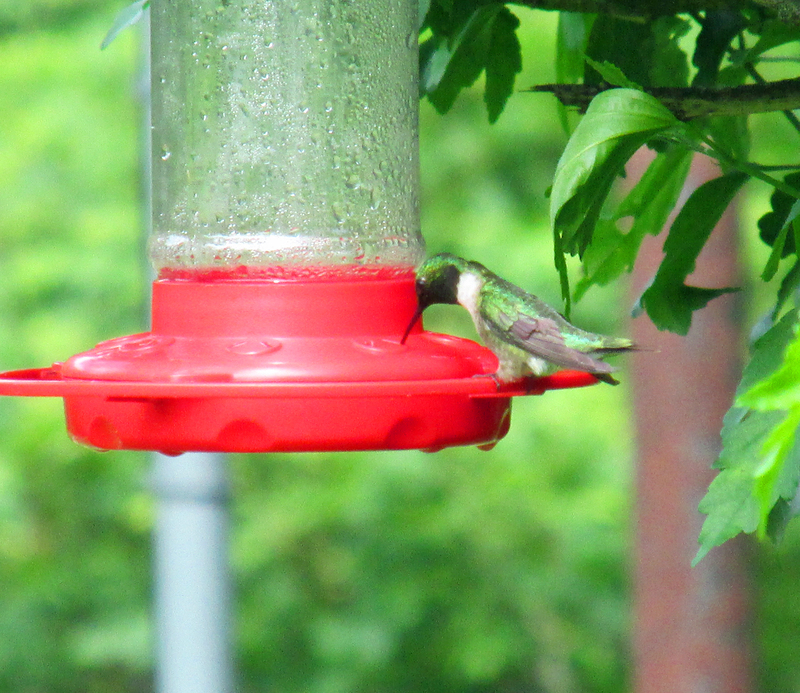 » Cecilia Murrell of Abingdon,Virginia, has four feeders available for the hummingbirds, but the first one to show up on Thursday, April 21, fed at the nearly empty feeder. “Maybe he has visited me before,” she wrote in an email. Photo by Donna Rea This was the first hummingbird to visit the Rea residence in 2016. » Donna Rea shared on Facebook that hummingbirds had returned to her home in the Rock Creek community of Erwin. » James Noel Smith reported on Facebook on April 26 that hummingbirds are back at his home in Unicoi. To learn more about birds and other topics from the natural world, friend Stevens on Facebook at https://www.facebook.com/ahoodedwarbler. He is always posting about local birds, wildlife, flowers, insects and much more. If you have a question, wish to make a comment or share a sighting, email ahoodedwarbler@aol.comahoodedwarbler@aol.com. This entry was posted in Birding, Birds, Hummingbirds, Spring migration, Young birds and tagged Birding, birds, Bristol Herald Courier, Bryan Stevens, Carter County Compass, Elizabethton Star, Erwin Record, Feathered Friends, McDowell News, Our Fine Feathered Friends, The Erwin Record on May 8, 2016 by Bryan Stevens. One question that tends to pop up every June in my email or on Facebook concerns the presence of hummingbirds. 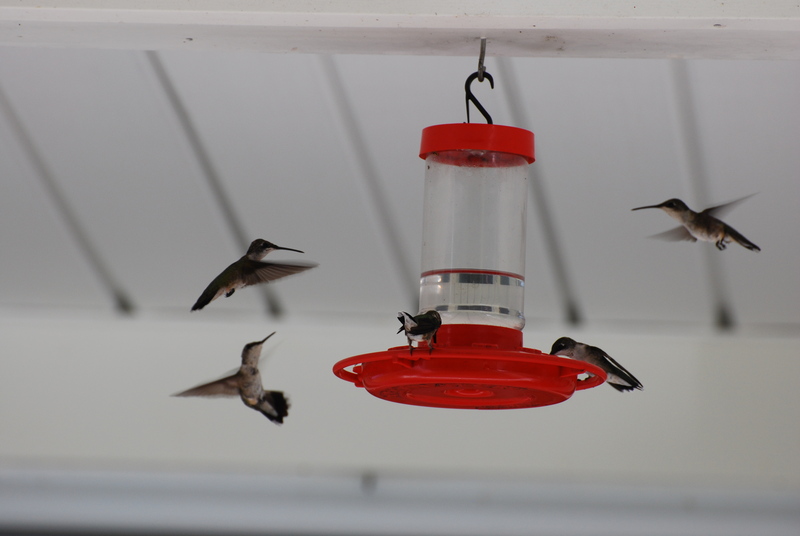 The status of hummingbirds at my own home since their arrival back in April has been somewhat sporadic. I think this has been noticed by some other people, too. Photo by Bryan Stevens A female Ruby-throated Hummingbird visits a feeders. Female hummingbirds in our yards in June and July are probably nesting residents. 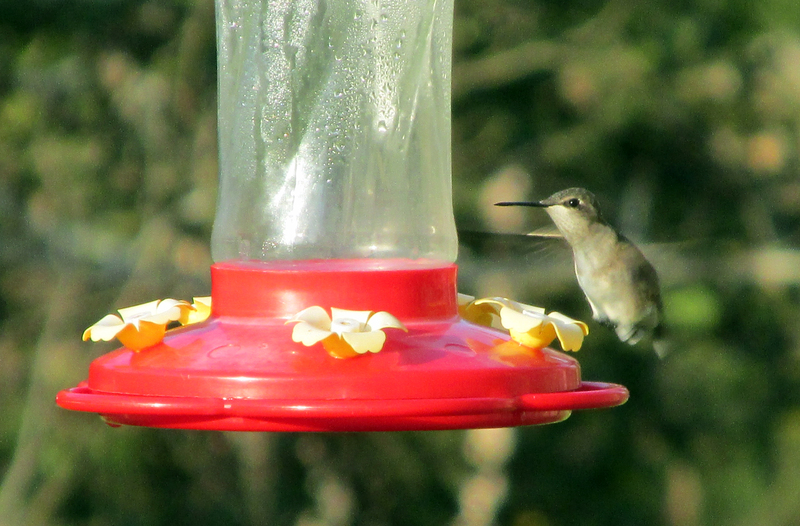 The hummingbirds were scarce in April and May. When June arrived, their numbers began to increase. However, this pattern that I saw this year is usually just the opposite. The hummingbirds are usually abundant in early spring, taper off in June and July, and then increase again in August and September. Basically, I think their numbers just naturally fluctuate. Some years we have more of them than other years. There are other possibilities to explain the absence of hummingbirds. It’s always possible that hummingbirds, adhering to the philosophy that “the grass is always greener” elsewhere have taken to exploring a neighbor’s yard and gardens. 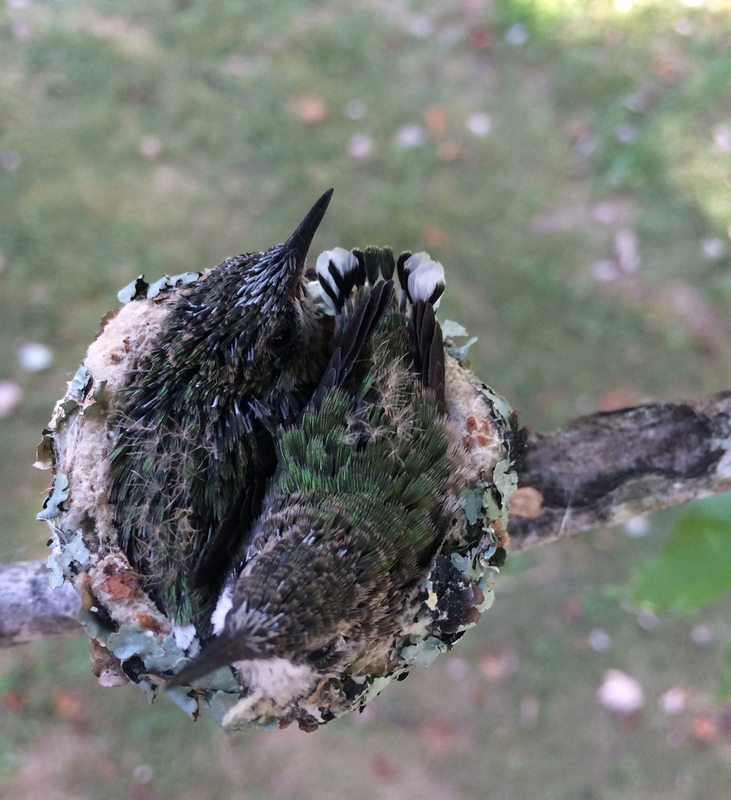 Hummingbirds, like many of the songbirds that spend the summer season with us, keep busy this time of year with the task of raising offspring. That alone could explain a temporary lull in their numbers in our yards and gardens. 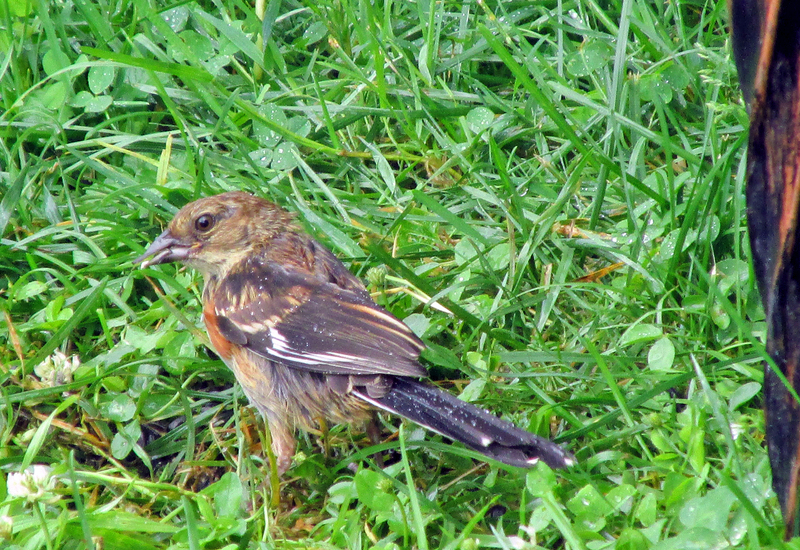 Photo by Bryan Stevens A young Eastern Towhee, not long out of the nest, looks for sunflower seeds in the grass beneath a feeder. Many species of birds attempt to nest two or even three times during the summer nesting season. 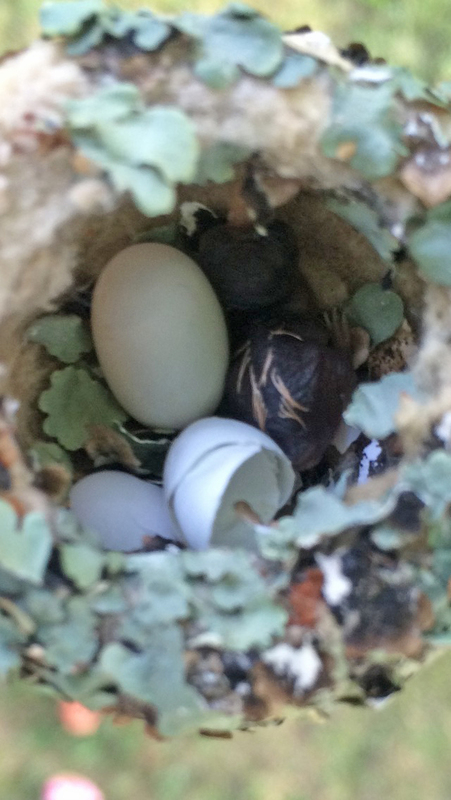 So far this year, I’ve observed nesting activity by a wide variety of birds, including Northern cardinals, brown thrashers, Eastern towhees, Eastern bluebirds, tree swallows, song sparrows, white-breasted nuthatches, Carolina wrens and downy woodpeckers. All birds, from tiny hummingbirds that are mere inches long to an ostrich that can stand more than nine feet tall, start out as eggs. 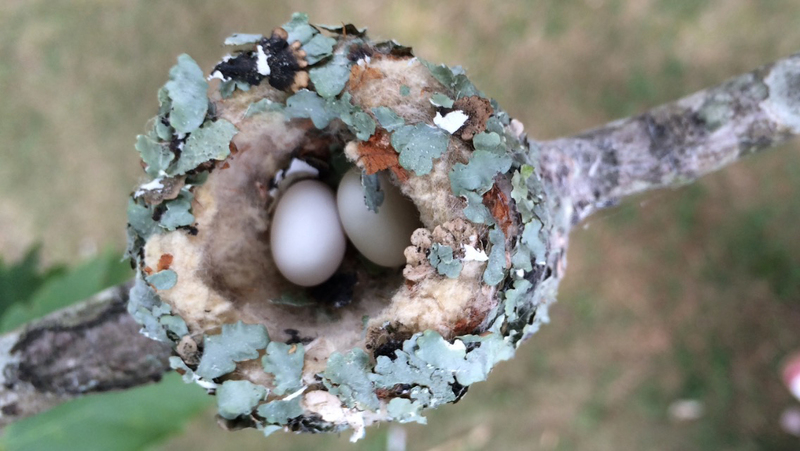 Birds have developed a range of ways to protect and incubate eggs to ensure the continuance of the species. For many birds, the strategy is to produce as many young as possible in a limited amount of time. The hooded warbler, which spends the winter months in Central America, will usually make multiple nesting attempts in a season. The female constructs a cup-shaped nest, which is a design common to many of our songbirds. She will lay three to five eggs in the nest. Incubation of the eggs is a duty usually performed solely by the female, but her mate helps by guarding the nest and surrounding territory. Both parents feed the young once they have hatched after about two weeks. Not all birds share in the task of caring for helpless young. For instance, the male ruby-throated hummingbird shows not the slightest inclination to assist the female with the duties of rearing young. All ruby-throated hummingbirds are raised by single mothers. Male hummingbirds spend the summer sipping nectar, dueling with other male hummers and courting multiple females. Hooded warbler pairs, as is the case with many songbirds, share the work of feeding and tending young. Many of these young birds spend very little time in the nest after hatching. Hooded warblers have typically left the nest within nine days of hatching, although parents continue to feed the young as they learn to fly and care for themselves. 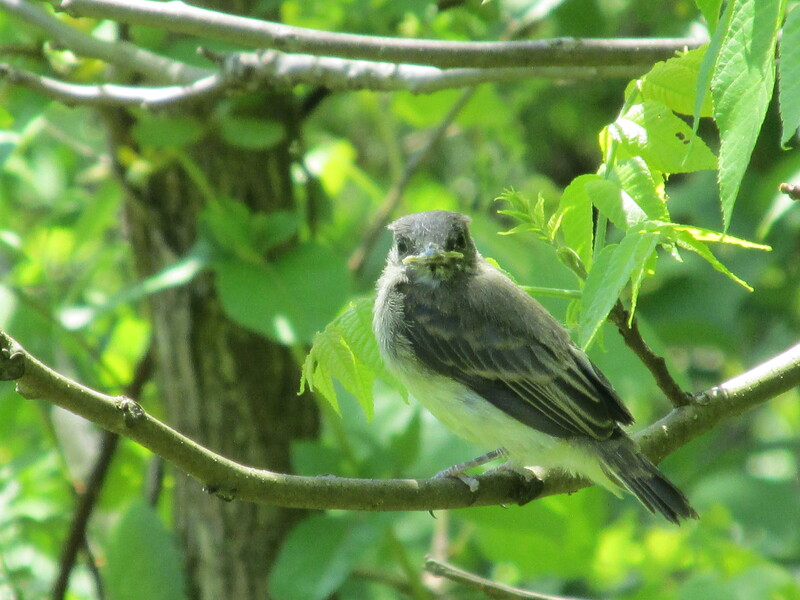 Photo by Bryan Stevens An Eastern phoebe fledgling perches on a tree branch. Some birds, such as Northern Cardinals, often delegate the duty to the male for caring for young that have fledged from the nest. As the male trains and continues to feed the maturing young, the female cardinal often begins the work of building a second nest, laying another clutch of eggs and incubating them. Time is scarce. By getting a jump-start on a second nest, the female cardinal, if successful, may produce eight to ten new cardinals in a single nesting season. 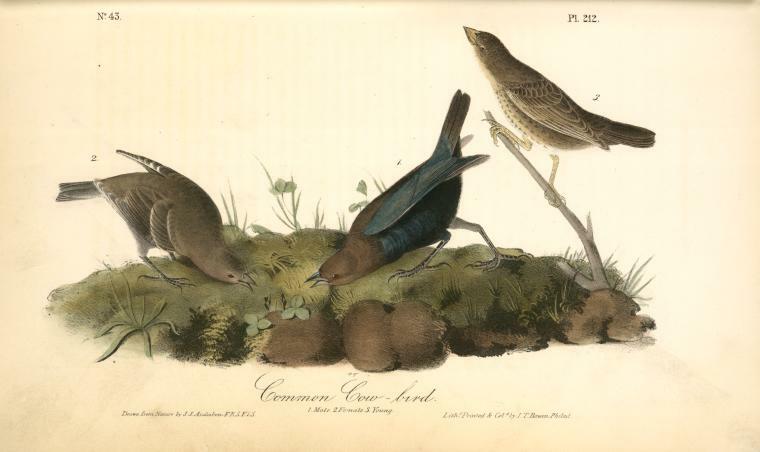 A painting of Brown-headed Cowbirds by John James Audubon. Some birds, however, have bypassed the necessity of nesting altogether. If all hummingbirds are reared by females, then all young cowbirds are from foster homes, or nests. Female cowbirds slip their eggs into the nest of other unsuspecting songbirds. The hooded warbler is often a victim of this practice, which is known as “nest parasitism.” Some experts have conducted studies that indicate as many as 75 percent of hooded warblers in some areas are parents to cowbirds foisted on them. Photo by Bryan Stevens Young barn swallows in their nest await a delivery of food by their parents. It’s not wise to condemn cowbirds for a behavior that would strike us as immoral. The peculiar reproduction strategy for the cowbird came about as a natural necessity. Cowbirds once followed the massive herds of bison across the North American continent, feeding on the insects and seeds displaced by the hooves of these huge animals. Since the bison herds stayed on the move, the cowbirds didn’t have the luxury of staying put for a couple of months to raise young. The decimation of the bison herds could have proven a disaster for the cowbirds. That wasn’t the case, however, since these adaptable birds simply switched from following bison herd to doing the same with the enormous numbers of domestic cattle that inherited the range of the buffalo, or bison. These are just a select few ways that birds succeed year after year in the never-ending effort to ensure the survival of the species for another generation. Many obstacles stand in their way. Any time you see birds bringing their babies to a feeder in your yard or a shrub in your garden, recognize this moment as a singular triumph for the labor and dedication our fine feathered friends have invested in this outcome. 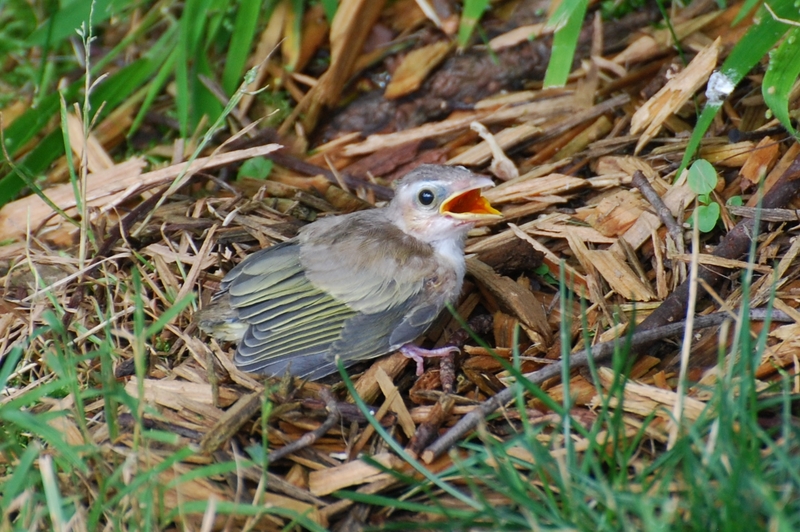 Photo Courtesy of Jean Potter A young Red-eyed Vireo calls for food while concealed on the ground after leaving the nest. As is the case with most songbirds, parents continue to care for young even after they have left the nest. This entry was posted in Birding, Birds, Hummingbirds, Young birds and tagged Birding, birds, Bristol Herald Courier, Carter County Compass, Elizabethton Star, Erwin Record, Feathered Friends, Hummingbirds, McDowell News, Our Fine Feathered Friends, Songbirds, The Erwin Record on July 5, 2015 by Bryan Stevens.